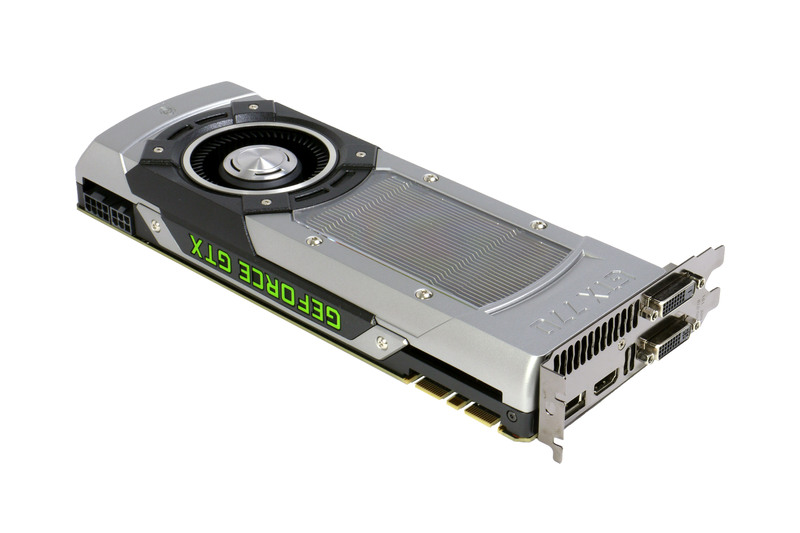 Last week saw the introduction of Nvidia's first GTX 700 series graphics card in the shape of the flagship Nvidia GeForce GTX 780. Delivering performance some 20% percent greater than last year's GTX 680 and only around 10% lower than the mighty GTX Titan, it was an impressive start. However, priced at £550, it's an impressively pricey start too. Indeed it has debuted some 30% more expensive than the GTX 680 when it arrived. 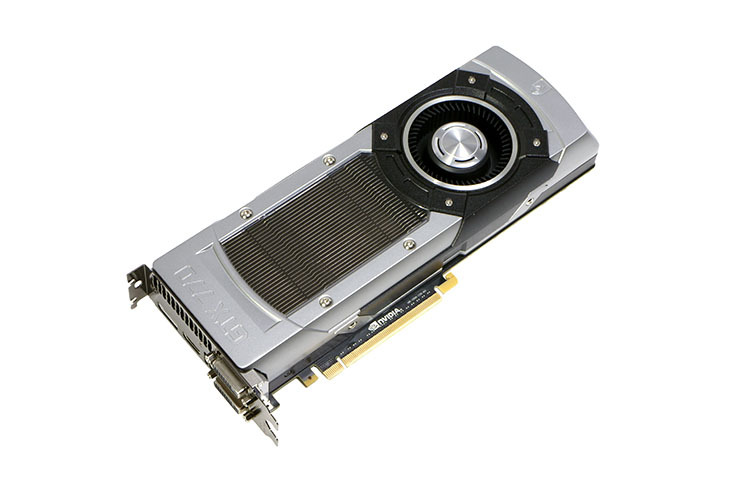 So for those for whom over £500 is just a little too much to spend on a graphics card, we now have the Nvidia GeForce GTX 770. The second tier part of the GTX 700 series, it may look nigh-on identical to its bigger brother but under the hood it sports a very different, though still very familiar, chip in the shape of the same GK104 that powers the GTX 680. Yes, the GTX 770 is essentially a re-badge job. As with the GTX 780, there are no advancements in silicon production that we expect to lead to performance or power-consumption enhancements. 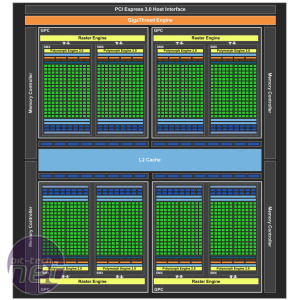 Instead the new card sports a modest core overclock from 1,006MHz up to 1,046MHz (1,058MHz to 1,085MHz boost) and a slightly more significant memory overclock from 6GHz to 7GHz. It also benefits from the improved Boost 2.0 advances of the GTX 780, for better granular management of its internal overclocking abilities. Two memory options will be available with either 2GB GDDR5 or 4GB GDDR5. While the chip at its heart may not have seen huge leaps forward, you'd never guess the GTX 770 was a mere overclocked GTX 680. 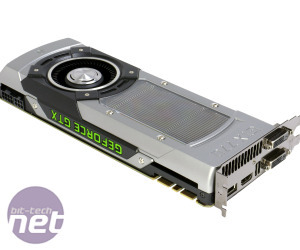 This new card sports the same HSF as the GTX Titan and GTX 780. As we pointed out in our reviews of those cards, this is one impressive looking cooler with a sleek mixture of aluminium and black plastic, a pointless but rather spiffing clear window above the heatsink fins and an all-important glowing green GeForce logo along its spine. The cooler is also more effective with its vapour chambers allowing it to be extremely quiet when idle and provide more headroom when under load. One potential downside of this fancy cooler is that the card is a bit longer and quite a bit heavier than both the GTX 670 and GTX 680: a concern if you're looking to include it in a Small Form Factor (SFF) or semi-portable build. The usual array of outputs are on offer with two dual-link DVI, HDMI and DisplayPort, allowing for surround gaming with three monitors. With a TDP of 230W, the card is quite a bit more power-hungry than the GTX 680 (195W) and as such requires both a six- and a four-pin PCI-E power input, compared to the 680's twin six-pin connectors. 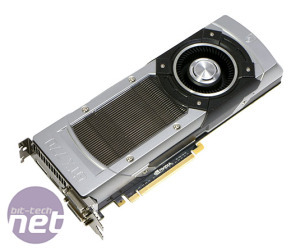 In fact, this card is only 20W lower TDP than GTX 780/GTX Titan. 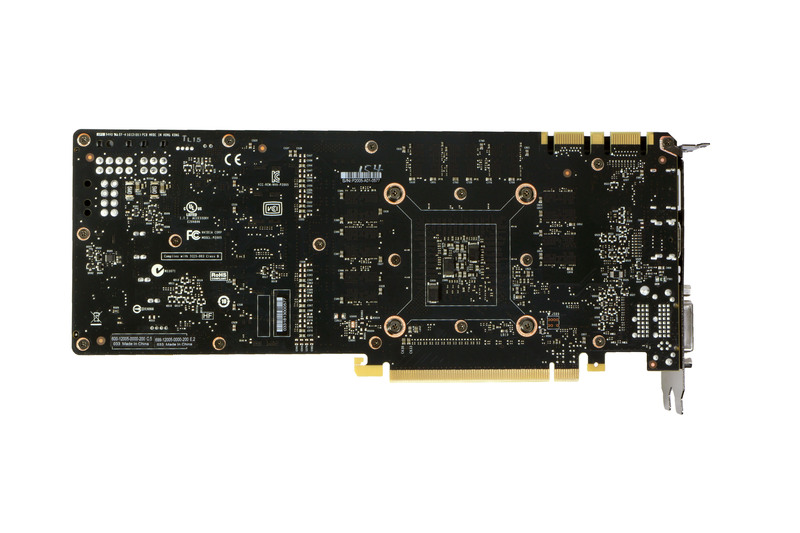 Getting back to the GK104 processor at the heart of the GTX 770, it is as mentioned identical to that of the GTX 680, which debuted the Kepler architecture. 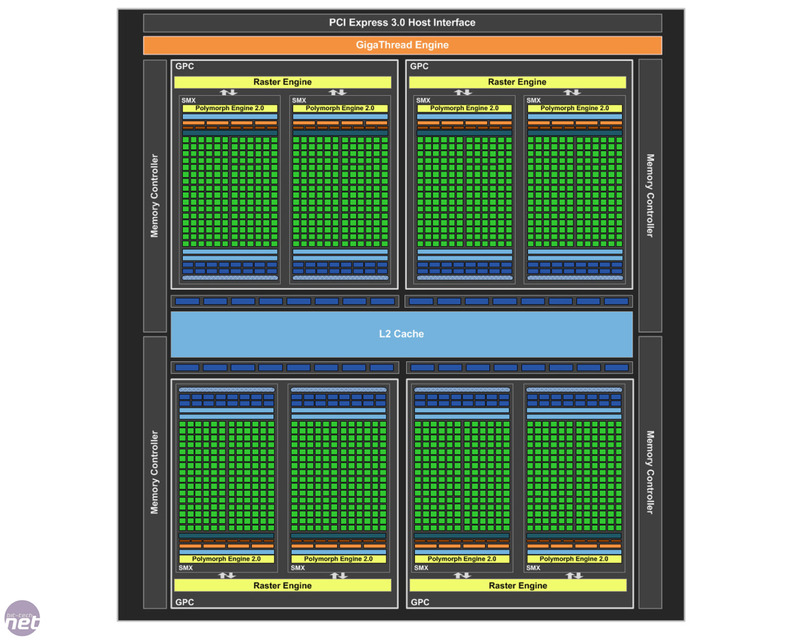 Specifically it sports 1,536 Stream Processors (SPs) split up into four Graphics Processing Clusters (GPCs) and eight Streaming Multiprocessors (SMs). These are accompanied by four rasterisers, 128 texture untis, 8 tessellation units and 32ROPs. On the GTX 670, this card's spiritual predecessor, one of the SMs was disabled, reducing the total number of stream processors to 112, the tesselation units to 7 and the texture units to 112. This alone will account for a significant boost in performance over that card. As for the GK110 of the GTX 780 and GTX Titan, it ups the anti considerably with 2,688 SPs, 4 rasterisers, 14 tessellation units, 224 texture units and 48 ROPs. These are also arranged differently, with three SMs per GPC - one GPC has an SM is disabled. On the GTX 780 one of these GPCs is disabled giving it 2,304 SPs, 12 SMs, four GPCs, 4 rasterisers, and 194 texture units. Thanks to the slightly faster memory on the GTX 770, compared to the GTX 680, it has a healthy memory bandwidth advantage of 224GB/sec compared to 192GB/sec. 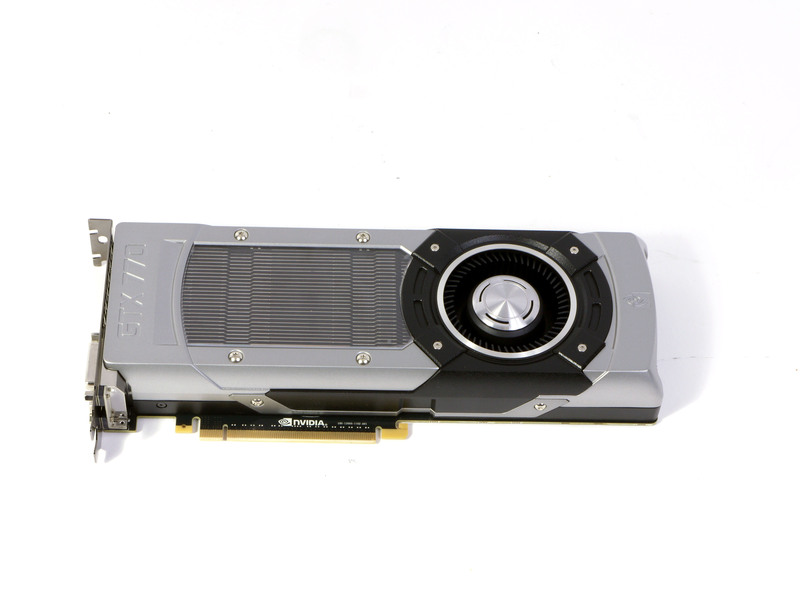 Again, the GTX 780 has am even bigger advantage, though, with its 384-bit interface and 288GB/sec total bandwidth. MSI pairs the GTX 760 with its new Twin Frozr cooler, with an eye to some awesome overclocks.